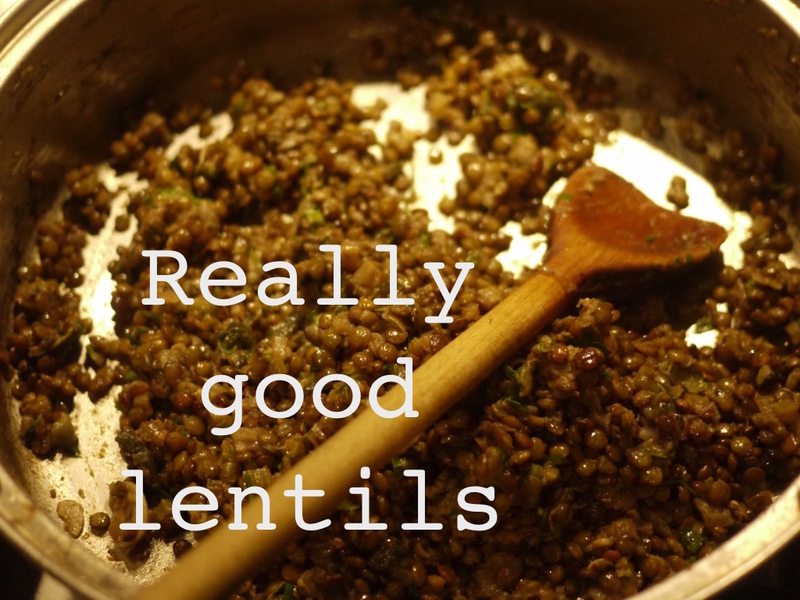 As a former long-term vegetarian I am, by practice and obligation, a lover of lentils. Brown, green and red are great (especially red for soups) but your queen of lentils is the Puy, a pretty little green jewel that cooks up into a nutty, earthy mouthful with a goodly amount of bite. They are slightly more expensive than your bog standard lentil but still dirt cheap in comparison to basically anything else you can buy. For those non-vegetarians who are a bit leery of lentils I am reliably informed that lentils and bacon are the best of friends so you could add a rasher or two when frying the onions if it makes you any more comfortable (yes, former vegetarian but no, I won’t eat pork). This is an adaptation of Stephanie Alexander’s Brown Lentil Salad from The Cook’s Companion, which I consider to be a necessity in any household collection of cookbooks. It’s something of a master recipe that can be expanded with whatever you like or happen to have in the fridge at the moment. Extra vegetables – there’s a zucchini in the one in the picture up there – and spices can take this in whatever culinary direction you’d like. Cumin and lentils are very good friends for example. Replace the vinegar with lemon juice (etc, etc, etc). Note – Stephanie would have you soak the lentils for 2 hours and save the soaking liquid for cooking the lentils – and by all means, if you have the time and the inclination, go for it – but you don’t need to soak them if you can’t be arsed. Put the ½ cup of olive oil into a wide pan that will take a lid – preferably the lid should be one of those ones that has a steam escape valve, but no matter if it doesn’t, just put the lid on slightly askew so some steam can get out when the time comes. Slowly fry the onions and celery until they are a light golden colour, add the garlic and herbs and fry for a minute or two – I don’t ever bother making a bouquet garni into an actual bouquet, I just throw them in the pot untied. Add the lentils and enough water to cover them – about 1 ½ to 2 cups*. Add the salt (or if you also happen to be cooking for a baby then wait until the end to add the salt so you can leave some aside without salt) and bring to the boil. Cook over a moderate heat with the lid on but taking it off to stir frequently until the lentils are done – tender, but not mushy. I find this can take anywhere between 25-40 minutes. When the lentils are nearly done take the lid off and let any excess liquid boil off, turning the heat up if you have to. Turn off the heat and stir the parsley, vinegar, extra-virgin olive oil, and lots of pepper into the lentils. Taste, and adjust the seasoning to your palate. Great hot, warm or cold. * Stephanie’s recipe calls for just one cup of the soaking liquid, I’ve never found this to be enough liquid even if I have soaked the lentils. The way the recipe reads it seems to imply that you should be cooking this with the lid off but I find if you do that you end up with really unevenly cooked lentils, which is gross.